The mission of the Jonesboro Police Department is to maximize the quality of life of the citizens in which we serve; to be compassionate and courteous; to uphold the law fairly and firmly; and change and mold our department as necessary to maximize our service in meeting the needs of a growing city. 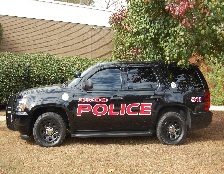 The Jonesboro Police Department is one of the smaller law enforcement agencies within Clayton County but has the opportunity to create and sustain that small town atmosphere while delivering the highest level of professional police service. The police department is made up of twenty-six (26) sworn personnel and seven (7) civilian employees. Located just fifteen minutes south of Atlanta and five minutes south of Atlanta Hartsfield-Jackson airport the Jonesboro Police Department services many of the visitors and residents of metro Atlanta. Creating that small town atmosphere is one of the unique charms for the City and something that the Police Department is proud of. Even though appearances are such, the police department is faced with the same criminal activity as any other City and is able to deliver the same level of service and protection like other metro agencies. The police Department takes pride in having the lowest crime rate in Clayton County and strives to be the leading law enforcement agency in the County. The Coffee with a Cop session is an opportunity for the public to meet with officers in a comfortable environment and talk about any subject from crime trends to neighborhood nuisance issues. You bring the questions...We bring the answers and coffee! Initial Reports can be obtained from the Jonesboro Police. Documents requested through open records must be picked up at Police Headquarters. All other information included in a report/investigation can only be released through open records and must be requested in writing. All requests will be processes within three business days as specified by Georgia Open Records Act after the request is received. Please be advised that certain records are not releasable under Open Records due to cases involving Active/Pending Investigation/Pending Prosecution/the nature of a crime or incidents with Juveniles involved. Requests can be made via email jonesboropolice@jonesboroga.com, or in person at the Jonesboro Police Department. Click here for Online Open Records Request Form. On August 6th, Officer Cato received a call about a child who had fallen into a pool. Officer Cato was nearby the location on his way to work. After receiving his supervisor’s permission, he answered the call and was first on scene. With disregard for his own safety, Chris Cato jumped into a very stagnant pool, but was unable to find the child due to the extreme conditions of the pool. After four tries, he found the four year old child and brought him to the surface, where he was administered life-saving efforts by EMT’s. Unfortunately, four year old Donovan Daniels did not survive. His only chances of survival were the valiant efforts of Jonesboro P.D. Officer Chris Cato. Chief Allen presented Officer Cato with a Ribbon of Valor and a letter of commendation at the August City Council Meeting. We salute Officer Cato for his bravery and caring.